Breakfast is undoubtedly my favourite meal of the day and its something I’d happily eat morning, noon and night. During the week coffee is the star of the breakfast show, a wee bowl of Weetabix will perhaps get a look in if I haven’t faffed around with my hair for too long. Come the weekend I like to turn breakfast into a meal I can linger over, rather than simply to fuel the day ahead. I’m talking about a long lazy brunch (with family, friends or your luvvah) with unlimited coffee and a pile of Sunday newspapers to enjoy while stretched out on the sofa. 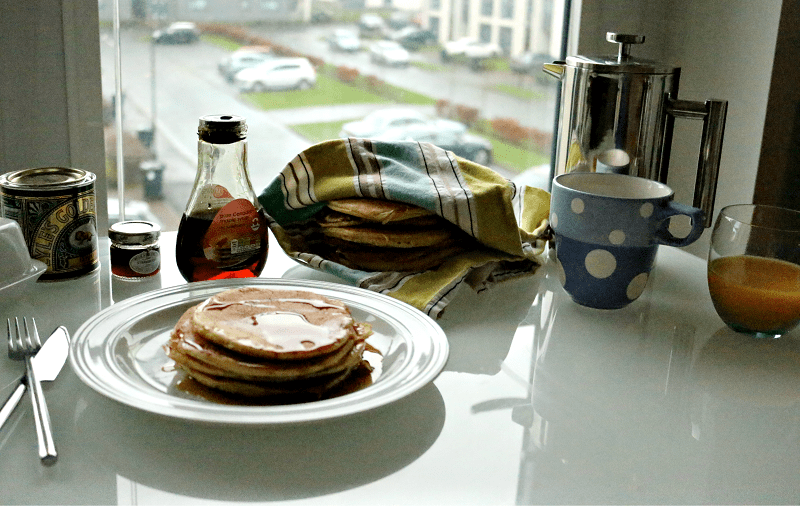 Indulging in this kind of meal doesn’t necessarily require hours spent in the kitchen thanks to the humble pancake. When cooking for just the 2 of us I make a half batch of the pancake batter which will give us approx 10 medium pancakes. 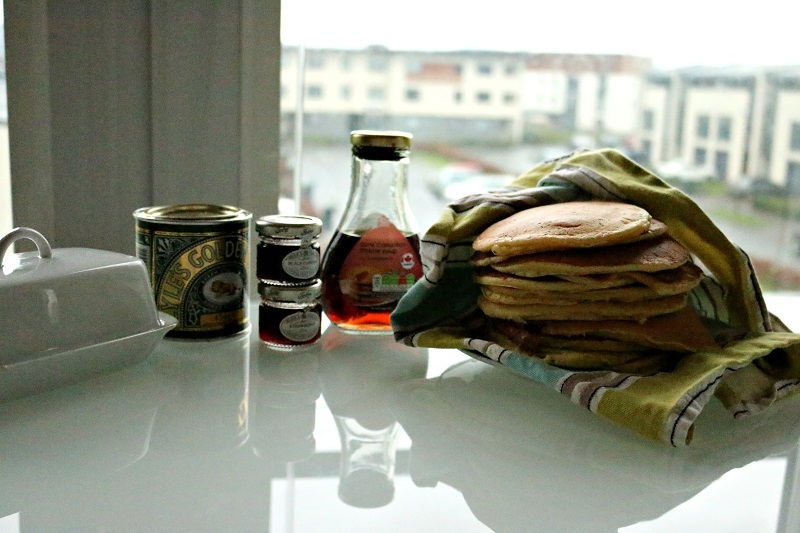 However, if you’ve gone to the effort of making fresh pancakes, you may as well make loads of them. You can heat them up in the microwave quickly during the week for breakfast and, spread with a little jam, they make a good after-school snack for kids. Start by melting the butter in the microwave for 20 seconds. While the butter is cooling, measure out the dry ingredients into a bowl. In a jug, whisk the eggs, milk and cooled butter. 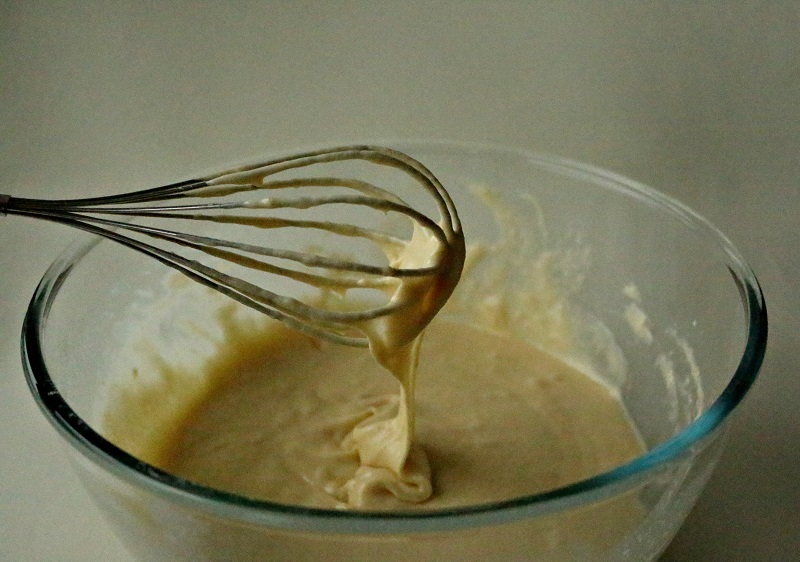 Sift the dry ingredients into the jug of wet ingredients and whisk until there are no lumps.You should now have a batter which is thick but will run off the back of a spoon. Something similar to custard. If you feel the batter is too thick, add a little more milk to thin it. You can leave this batter in the fridge, covered with cling film, overnight if you like. 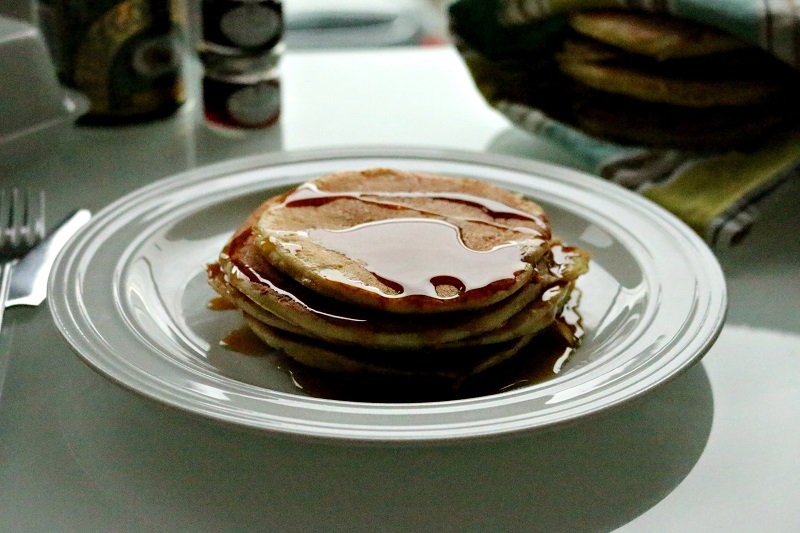 Bear in mind the longer you leave pancake batter to stand, the thicker it becomes so you may need to add a little more milk until you have the right consistency again. Place the frying pan over a medium-high heat. Add 1 tbsp of butter to the pan, let it melt and sizzle then wipe it away with kitchen paper. Meanwhile place a clean dish-towell on a plate. You will use this to wrap the cooked pancakes in to keep warm, while cooking the rest of the batch. Pour 1 ladle of the pancake batter into the pan and let it cook until bubbles start to appear on the surface. Flip the pancake with spatula, then after a few seconds press down lightly on the back of the pancake with the spatula. Cook until both sides are golden brown. This first pancake will most likely turn out undercooked or overcooked, this is ok because it’s your test pancake. Use it as as guide to adjust the temperature or your cooking time. Place the pancake in the clean dish-towel and continue cooking until you have finished the batter. And you have yourself a meal to linger over for hours.